Refresh your Skills and Confidence ! If you have not dived for a while, then you will benefit from refreshing your diving knowledge & skills. PADI Scuba Review is designed to help you develop confidence & ensure you remember how to dive safely. 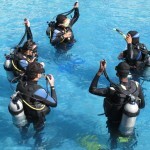 Have a scuba diver certification or be enrolled in a scuba certification course. Refresh your diving knowledge & skills with PADI Scuba Review. During the course, you’ll make a knowledge assessment and confined water skills review under the supervision of your PADI Instructor. Explore the most colorful and interesting diving sites in the world’s second largest coral reef. Refine the basic skills you learned as a PADI Open Water Diver and elevates them to the next level. This is a great way to get more dives under your belt, increase confidence and build new skills. Keep Diving!